Savoury is tops for me, as long as the sun is shining – or at least trying to. I am quite happy to snack on savoury dishes all day long – from breakfast until dinner. It is for this reason I have so many more savoury dishes to try than sweet ones. 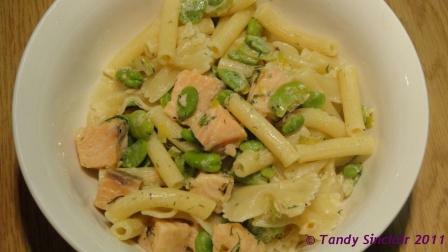 This week, I am combining this weeks’ something savoury challenge with Presto Pasta Nights. Please go and take a look and take part. Pasta is a regular weekly meal in our house and the challenge for me is to come up with something new. Chica Andaluza is a first timer has delighted my taste buds with a pear, lime and ginger preserve. Take a look here for her ensalada cateta! Cindy has cooked up a stir fry using ClemenGolds. Browniegirl Colleen has made the most amazing tarte tatin. She also used ClemenGolds! A Dash Of Domestic is another first timer and she has an intriguing bread recipe using chocolate and zucchini. Everydaycook was the first to randomly select the winner – well done Colleen, your apron is on its way to you! As an aside, everyone who was asked to randomly choose 1 or 2 chose 2! It is my pleasure – watch this space for the next give away! Wow,pear,lime and ginger preserve? Yummy! Enjoy the week!